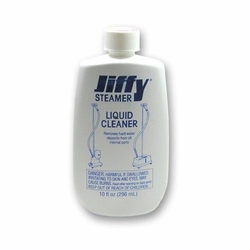 Jiffy Liquid Cleaner removes hard water deposits from Jiffy Steamers. It is easy to use and works on all Jiffy Steamer models. It is suggested to use this cleaner as a preventative solution every 3 to 6 months depending on the quality of your water and frequent usage of the steamer. Three 10 ounce bottles per package. Not available for export.